If your fantasy is to live totally off-the-grid anywhere around the world, that dream just got one step closer to reality. 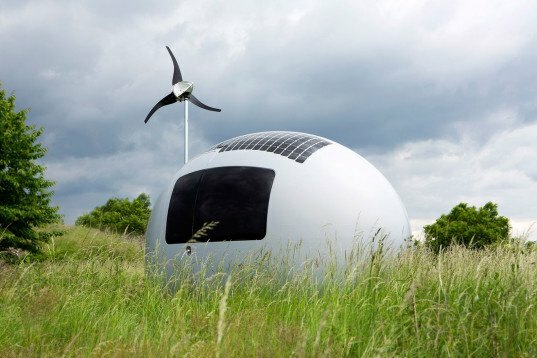 Nice Architects just unveiled the first photos of their incredible egg-shaped Ecocapsule home - and the tiny solar and wind-powered dwelling will be available for sale later this year. Nice Architects has already completed a prototype, and they plan to ship the first units as soon as Spring 2016 - check out the first photos of this low-energy sanctuary after the break, and picture yourself living the dream. Like the Swiss Army Knife of tiny homes, the Ecocapsule packs everything you need into one very efficient, compact design. 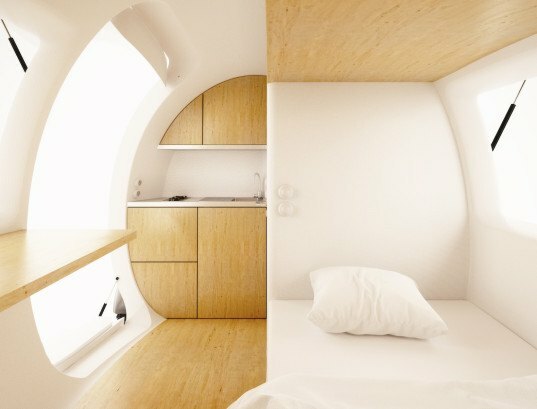 Replete with rather luxurious amenities, including a double bed, kitchenette, storage space, and bathroom with a shower and a toilet that collects bio waste, the Ecocapsule can used as a tiny home just for you, a pop-up hotel, a humanitarian refuge, or even an electric car charging station. Its 9744Wh battery is powered by a 750W silent wind turbine and 600W solar outputs that enable it to operate completely off-grid. A dual-power system offers an additional source of electricity during periods without sufficient sunlight or wind. The structure’s rounded shape also helps to easily collect rain water, which is then purified with a built-in filtration system. The amazing micro-dwelling is perfect for nature lovers, scientists, photographers, rangers and anyone who wants to stay off-grid for long stretches of time. The architects also recommend it as an urban dwelling for singles in high-rent areas such as Silicon Valley or NYC. The little “egg” home measures just 4.5 meters (14.6 feet) in length, 2.4 meters (7.9 feet) in width, and 2.5 meters in height (8.2 feet), with a reasonable living space around eight square meters (86 square feet). When you’re ready to move on to your next destination, the capsule fits snugly into a standard transportation container. Nice Architects plans to announce pricing for the Ecocapsule egg home at the end of 2015 – just in time for pre-orders. They’ve focused on reducing the size and weight of the pod so that it can be easily transported – approximate shipping costs range from 1500 Euros from Slovakia to Melbourne, to 2200 Euros from Slovakia to New York. Nice Architects plans to launch one version of the Ecocapsule initially, and they plan to offer additional customizations after the first units are sold. excelent!, I was truing to find something like this for the Puna of Argentina, the only region in the world that has similar conditions as Mars!!! Geologists visita the region to make lots of tests. Please tell em an idea of the cost, time of production? shipping? Do you have a Canadian distributor? I am interested in it. Awesome! Looks as if it could also float with side stabilizers, which could also switch to extended wings as Solar flight is already history. Google can incorporate this into their new Google mobile! Man the single mans freedom! Serious though this is great...mini caravan also! Son of Mork from Ork. Interested in testing and possible distribution. Many areas where we are have been deemed non-build so this would be very lucrative. Please contact. Have a parcel of land for demos and site usage. So fun to find your site, fun ideas! Hey, I work as an elementary art teacher located in a rural area that has been heavy hit this past month by numerous wildfires that burned(still fires) hundreds of thousands of acres in one county. So many people lost their homes, burned land, and animals. It is a vagabond/resourceful idea to think of evacuating your whole home, like pulling a horse trailer when it is time to flee the fire. I LOVE this! I'm sure they can make them a little bigger though. How is it cooled? How is it heated? Would be interested to test this in Indian conditions! I look forward to testing it in the field. How much are they, I would like to try one of these on my private island in the Bahamas. Would love to have about 20 to 50 of these on the Cay. Who do I contact. Looks amazing! Do you have an american distributor? Interested in it. 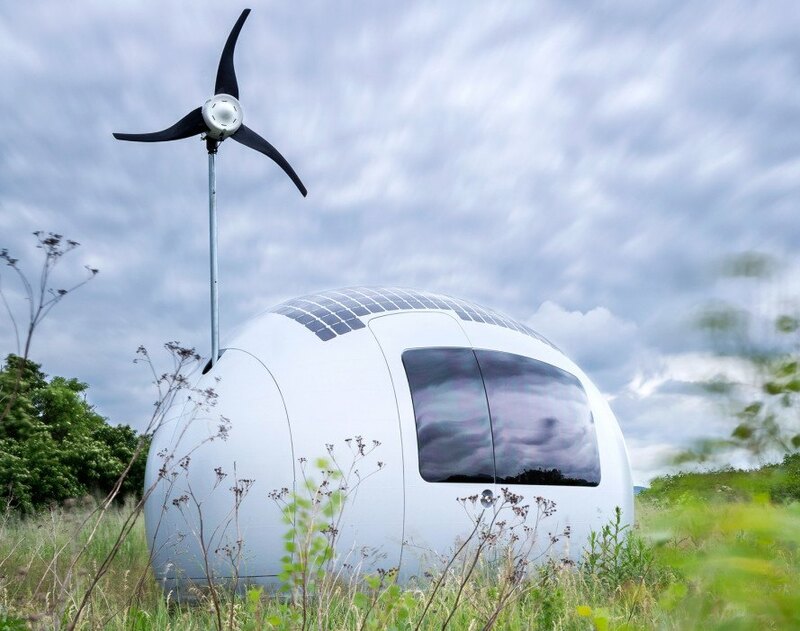 Like the swiss-army knife of tiny homes, the Ecocapsule packs everything you need into one very efficient, compact design. Replete with rather luxurious amenities, including a double bed, kitchenette, storage space, and bathroom with a shower and a toilet that collects bio waste, the Ecocapsule can used as a tiny home just for you, a pop-up hotel, a humanitarian refuge, or even an electric car charging station. The amazing micro-dwelling is perfect for nature lovers, scientists, photographers, rangers and anyone who wants to stay off-grid for long stretches of time. The architects also recommend it as an urban dwelling for singles in high-rent areas such as Silicon Valley or NYC. 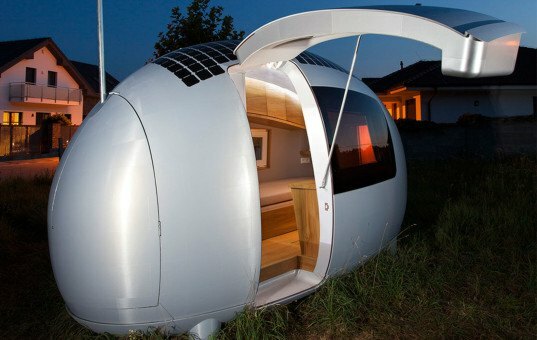 The Ecocapsule offers a reasonable living space around eight square meters (86 square feet). The little "egg" home measures just 4.5 meters (14.6 feet) in length, 2.4 meters (7.9 feet) in width, and 2.5 meters in height (8.2 feet). Its 9744Wh battery is powered by 750W silent wind turbine and 600W solar outputs that enable it to operate completely off-grid. A dual-power system offers an additional source of electricity during periods without sufficient sunlight or wind. The structure's rounded shape also helps to easily collect rain water, which is then purified with a built-in filtration system. The amazing micro-dwelling was designed especially for those who are required to stay in the nature for long stretches of time, such as scientists, photographers, rangers or "extreme" tourists. When you're ready to move on to your next destination, the capsule fits snugly into a standard transportation container. Nice Architects plans to announce pricing for the Ecocapsule egg home at the end of 2015 - just in time for pre-orders. They've focused on reducing the size and weight of the pod so that it can be easily transported - approximate shipping costs range from 1500 Euros from Slovakia to Melbourne, to 2200 Euros from Slovakia to New York. Nice Architects plans to launch one version of the Ecocapsule initially, and they plan to offer additional customizations after the first units are sold.